You can study in your home, or anywhere that you can roam. And if your summer’s at OWU, you can learn on campus, too! And, “Oh, the Places You’ll Go” with the opportunities created by Ohio Wesleyan University’s 2019 summer courses. This year, Ohio Wesleyan is offering 33 online courses – including 11 new ones – along with 24 traditional on-campus classes to help students learn all the things they need to know, for all the places they want to go. Registration for the 2019 summer session opens April 11, with classes beginning May 20. Both five-week and 10-week sessions are available to help students seeking to catch up, get ahead, or change direction as they work toward graduation. This year’s offerings include everything from accounting to zoology. For senior Molly Geffken, taking online classes last summer helped her stay on target to graduate in May with her desired depth of study. After earning her OWU degree, she plans to complete a paralegal program this summer, work for a year, and then enroll in law school in August 2020. During her four years on campus, Geffken immersed herself in many OWU opportunities, including joining the Kappa Kappa Gamma sorority; serving as manager of the women’s basketball team; studying for a semester in Salamanca, Spain; and serving as vice president of the Senior Class Advisory Council. 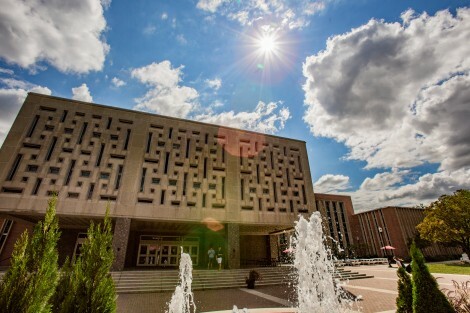 For students considering the 2019 summer session, the online courses are open to OWU students only, while the traditional courses are open to everyone. In addition, OWU students who received a Federal Pell Grant for the 2018-2019 academic year may be able to use these funds during the summer session. For more information, contact the Office of Financial Aid. For more information about Ohio Wesleyan’s summer session courses, both online and on-campus, visit www.owu.edu/summer.